I would never have bought this camera if it was not in a package I got. which contained 7 broken cameras. I never liked plastic cameras. I even resent the special reinforced abs poly special carbonate my Canon 500 is made off. Still it was there and as promised it was broken. I was not really impressed with it. So I decided to strip it for the parts. That is when I was suprised, after taking the top off the and the front of the camera. The lightmeter suddenly sprung back to live. Film advance, working but the shutter didn't open or close. Sure I could put it on auto, set the aperture but the shutter remained closed. By now I was a bit intrigued so I decided to open it up further. Several screws fell out off the bottom. Filmadvance went wizzz and the whole camera quit on me. After some searching I found that a small lever was bent, I bent it back and the camera worked again! Dang.... again no spareparts... I hate stripping a working camera for parts. It is just not done. The Vilia Auto was made from 1974 to 1986 and more than 2 million were made. The lens is a Triplet 69-3 40/4mm. The lens has both distance symbols and the distance in meters. So 0.8 meters is represented by a little head figure. Unfortunatly it is not a rangefinder. The big lightmeter coil takes up all the room for that. I'm still not impressed by the Vilia. It is a black box of plastic. Due to the lens it is not an easy pocket camera. I never liked guessing the distance, allthough I usually get it right, I tend to forget to set it with a camera like this. But in its defense it has a lightmeter. The meter is even seen inside the viewfinder. It can be set to auto, which is nice, you just have to worry about distance and framing your shots. I have no idea how good the lens is, it is an all glass lens. But I have no idea how it performs. It works now but it feels cheap. 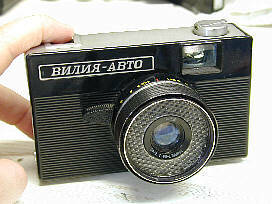 It is an ordinary camera and lacks a bit of class.